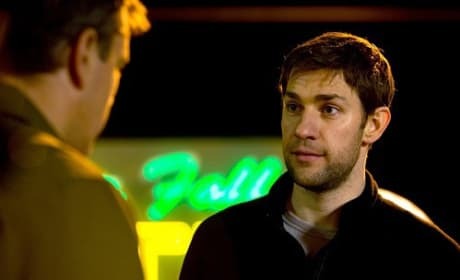 John Krasinski stars in Promised Land. The film co-stars and is co-written by Matt Damon. The star of Promised Land, John Kraskinski. The Office star wrote the film with Matt Damon. 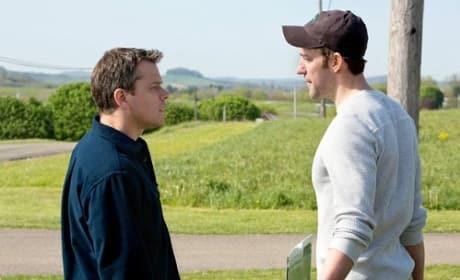 Promised Land co-stars Matt Damon and John Krasinski. Damon and Krasinski wrote the screenplay. Drew Barrymore and John Krasinski star in Big Miracle. The duo play real life characters who bond while saving whales in Alaska. 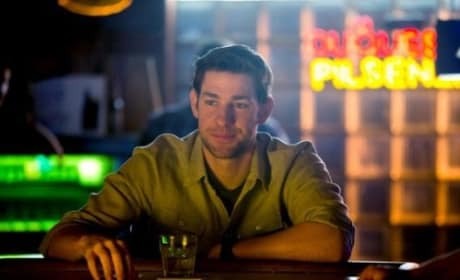 John Krasinski is trying to build a solid film career, but he may always be destined to be known as Jim from The Office. Not that this is a bad thing. The Newton, MA native has starred in License to Wed and Leatherheads.